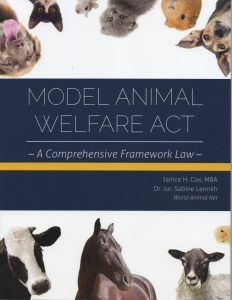 Model Animal Welfare Act by Janice H. Cox, MBA and Dr. iur. Sabine Lennkh. World Animal Net. The Model Animal Welfare Act — A Comprehensive Framework Law is a guide to modernise animal protection legislation. It is an invaluable resource for animal advocates in any country who work in the areas of public policy and legislation. The authors are Janice Cox, MBA, who has worked in animal protection for more than 25 years and is co-founder of the book’s publication World Animal Net, and Sabine Lennkh, lawyer with a Doctorate from the University of Salzburg, Austria. Her thesis was titled The Adaptation of European and Non-European Animal Welfare Law Models to the Seychelles. Cox and Lennkh bring to this publication their considerable insight and experience. The book is available for free here and a published edition is also available for sale.